These Chrome Hangers combine a modern look with rugged chrome plated steel construction. Each hanger includes two clips to display pants, skirts or accessories. These hangers will not sag or bend. The space saving body with swivel hook and loop simplifies garment transporting. Add the hanger pins through the hanger hoop to keep all your garments together. Hanger Pins sold separately, search item 8092. 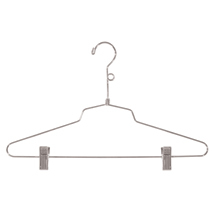 These 16" Chrome Combination Hangers can accommodate a wide variety of both men`s and women`s clothing.